Left to right: Kitte Dahrén (Sweden), Kineret Ben-Knaan (USA), Andrew Darby (USA), Nathalie Clot (France). Abstract: At the SLU University Library we have a strategic goal stating that the library should “work strategically with user centered methods in order to create relevant, seamless and cohesive user services”. To deliver on this goal we launched a prototype UX support service called the UX Button in December 2018. The support is scalable and we expect it to change with the needs of our organisation. We hope to inspire you to experiment with how to embed UX in your own institution and how to design and communicate UX methodology support in a simple and concrete way. Abstract: This presentation outlines planning and strategy for managing user experience data across the duration of a complex website redesign process. We discuss the use of a master spreadsheet to collect and visualize this data, and how this tool helped inform our post-assessment approach. Left to right: Claire Chickly (France), Pauline Moirez (France), Nadia Marks (UK), Carl Barrow (UK). Paper: How did UX help us switch from an institutional idea of project incubator to a meaningful innovation squad? Abstract: In 2017, our library created a project incubator to foster “innovative projects” internally, but without knowing what these projects would be and who would carry them out… We saw that the only way to come up with a proposition of real value was to involve project managers of the library. We organized workshops with different profiles and asked them to tell us stories of what problems they faced daily and did not manage to overcome alone. Abstract: In 2018 LSE Library embarked on a project to merge two archive catalogues. Knowing that staff found the catalogues difficult to use, the project provided the opportunity to find out why. This presentation details the process we followed to design improvements to our archives catalogue. At the start we knew very little about how users experienced the catalogue and so we utilised interviews, focus groups, co-design, and usability testing to develop our understanding. Ultimately, we made the catalogue more user focused, while improving the training and advice we provide and developing a wish list for future developments. Abstract: Institutional culture can have a huge impact on the design process. For some it means that important insights are never acted upon, for others it means they don’t try new things for fear of failure. This session will consider the impact, its effect on embedding UX research and moving into that important prototyping phase, where things are not perfect and have a higher risk of failure. By referencing some important UX research in Hull around trust in the workplace, it will demonstrate how cultural changes are helping us to feel empowered, be brave, and more importantly, move into that prototyping phase. Left to right: Tim Graves (UK), Riitta Peltonen (Finland), Kiti Vilkki-Eriksson (Finland), Keren Stiles (UK). Abstract: As an in-house passion project, the University of Sussex Library chose to develop its own interactive floorplans. These were designed to guide people to the right shelves: smartphone in hand. The design process took its principal inspiration from the London Tube map and the navigation screens in shopping malls, and involved a series of rapid prototypes tested iteratively with students. The Sussex floorplans offer no functionality that cannot be bought from third party suppliers for a few thousand pounds. However, this end product was completed at zero cost, and is a direct fruit of feedback from the library’s own students. Abstract: National Library of Finland is renewing primary customer interfaces of national bibliography service Fennica and discography service Viola. This project is a textbook example, how to use Double Diamond service design process and include user research and participatory design already into the early phases of the project and strategic decision-making. The research brought into discussions the needs of the users beneath the current solutions. UI improvements were just one aspect it affected. It also initiated two use cases that would benefit from automation and for which National Library of Finland already has suitable APIs to offer. Abstract: The Open University library’s user experience work has tended to focus on our taught students, who as distance learners typically use our online library. Last year we learned the importance of conducting UX studies with all parts of our user community, and found ways to hear from non-users. Examining the needs of university staff and postgraduate research students using mixed UX methods empowered us to improve our library building strategy to the benefit of our campus based community. Left to right: Stefan Fleig (Sweden), Hannah Fogg (UK), Lorraine Noel (UK), Debbie Phillips (UK). Abstract: This presentation is about how the Umeå University Library used UX techniques and an agile way of working to develop better and more ergonomic working conditions for their students. Different UX techniques were used in the process of gaining a deeper understanding of the user’s needs. One central theme that emerged during the ideation process was the need of a better ergonomic and more varied study environment. Inspired by modern offices, a concept focusing on active sitting was developed. It was first tested small scale, and by using UX as a tool for evaluation improvements were made along the way. Abstract: At both Anglia Ruskin and Huddersfield we’ve mainstreamed UX research into the roles of frontline staff. Our teams have worked in small groups to design, execute and report on modest but meaningful projects. In many cases these have resulted in changes and enhancements to our services and facilities. We’ll consider how this approach is working, and how staff feel about it – empowered or put-upon? As managers, are we making real changes as a result of their efforts? We’ll look at some of the projects and methodologies, the service enhancements that resulted, and the changed roles and perceptions of frontline staff. Abstract: In Welcome Week of September 2018 we conducted a cultural probe with new students at Royal Holloway, a joint project between the Library and the Campus Life team (a first for us). Turns out, they love the library building but don’t always attend induction sessions – how do we capitalise on this to make them love us forever? This session outlines proposed changes to the Library’s approach to induction for next year, based on the students’ reports of their first impressions of the Library, and their experience of their first two weeks here. Left to right: Claire Browne (UK), Maria O’Hara (UK), Vernon Fowler (Australia). Abstract: What are the benefits of allowing students to lead your UX research, and how can they contribute to your understanding of the lived experience of your users? Over the summer vacation, we were joined for 12 weeks by a 2nd year undergraduate student, who led a cultural probe into the post-graduate experience at Birmingham. The project also investigated and analysed various UX techniques. In this presentation I’ll discuss the benefits (and negatives) of having an intern within the Library team, some of the findings and insights from the cultural probe, our thoughts on the various techniques used, and of course what has happened with the findings since the project ended. Abstract: This year at King’s we decided to do things differently, we’ve decided to see what happens when we let students do the research. Armed with training and guidance, we’re sending 10 students out to try some UX on their peers. Come and hear the inside scoop on our experience, what was it like to guide students through their first experience of UX? Will their findings and insights differ from those of staff? What will we learn and what will we do differently next time? Watch this space to find out. Abstract: Before launching a new cardless member registration system, user testing revealed significant barriers to patrons who depend on assistive technologies. From manual testing with a blind participant, we identified issues ranging in severity including imperceptible validation and misalignment with mental models. Through collaborative and iterative design and development, further testing verified we resolved the issues, improving experiences for everyone becoming a Library member. 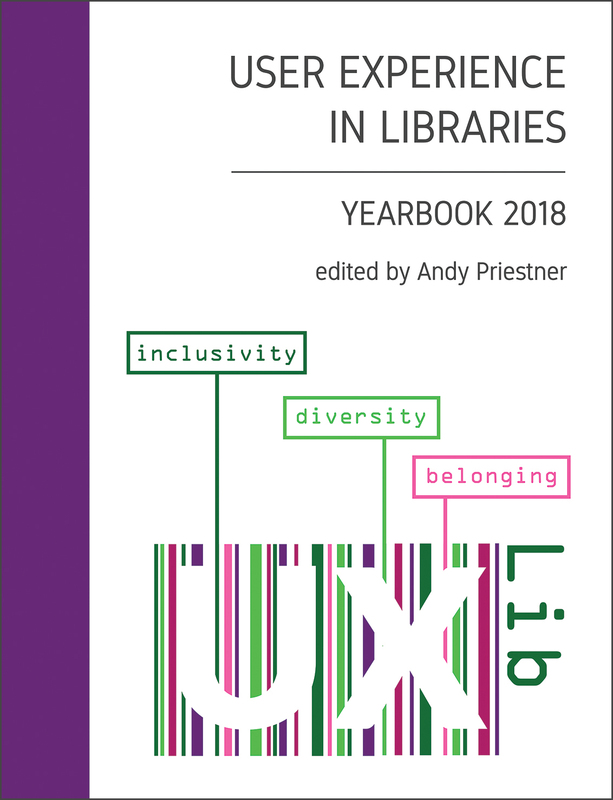 This case study demonstrates how manual accessibility user testing can build empathy, remove barriers, and lead to the design of inclusive digital onboarding to support a broader range of library members. Abstract: In 2015, the University of Worcester overhauled its library website, and along the way examined everything from the department’s name to its vision. The project was a success, with page views up 265% and a 6% increase in library student satisfaction. This session revisits our methods, grouped into three mindsets. – Think like a designer: be brutal with your brief and focus on visuals. – Query like an analyst: interrogate data and adapt your message to convince stakeholders. – Test like a user: assume nothing and be ruthless. By applying these mindsets, we resolved the majority of issues prior to testing.